In an increasingly competitive environment, the challenges facing microbiology laboratories are growing daily. In spite of ever-higher workloads, you need to deliver accurate results fast, ensure regulatory compliance, keep costs down and make the most of staff skills. You know that bioMérieux continually innovates to bring you instruments and reagents to help you better meet your needs. Now, we’ve applied that innovative spirit to bring you a unique partnership service to help you maximize lab efficiency and meet the challenges of today – and tomorrow. Health care systems today face pressures like never before – such as multi-drug resistant organisms (MDRO), an aging population, and the health and economic challenges these entail. The role of the microbiology lab in meeting these challenges is critical. But this means you are continually asked to perform at a higher level while facing greater constraints – in other words, do more with less. Given this range of pressures, how do you keep your competitive edge? A look at the patient's story reminds us why your laboratory aims for higher performance... and it also provides window into how you can make the most of your lab for best patient results and that competitive edge you need. 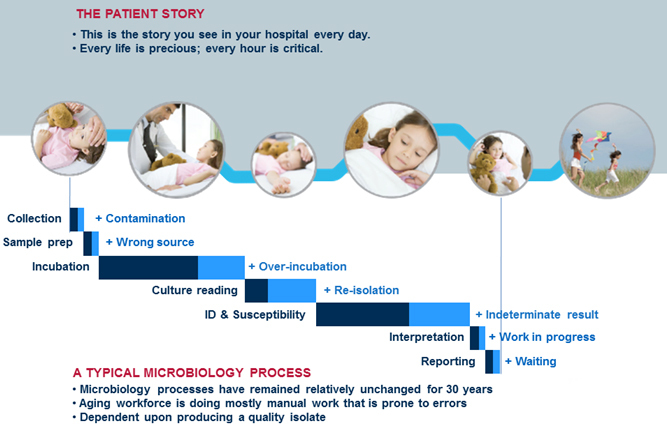 How can your lab help make the patient’s story better? There is room for new efficiencies in your laboratory – if you know how to access them. It’s important to get lab personnel on board because changing habits isn’t easy! At bioMérieux, we understand your dilemmas. We can leverage our unique perspective and expertise to partner with you to build and implement a personalized approach to maximizing your lab efficiency. After conducting a strategic assessment of your lab, we collaborate on a plan for transformation based on 3 main dimensions for action: process, people and technology. Together, we develop and implement solutions that respond directly to your particular challenges. Optimize lab processes and workflow so you can improve quality, provide quicker results and ensure regulatory compliance. Better use staff skills, motivated personnel with opportunities to boost competencies. Integrate leading edge technologies including Myla® middleware to connect your instruments and LIS for a “cockpit view” of operations and faster time-to-results. With more than 50 years’ experience working with microbiology labs, we’ve been there throughout the evolution of challenges facing labs around the world. Does this sound like an investment of time, energy and resources? It is. But partnering with bioMérieux to achieve maximum lab efficiency is one of the best investments you can make. If you’re ready to commit to this partnership, we can create measurable savings and efficiencies. 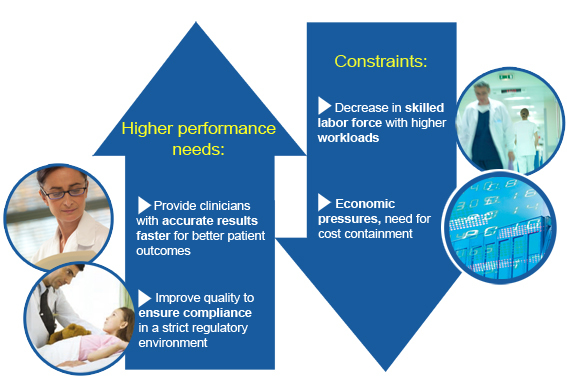 You’ll be able to make the most of your resources to help meet critical patient care needs and stay ahead of the competition by creating an environment of continuous performance improvement.